Mestra Teresa Merlo was born on February 20, 1894 in Castagnito d’Alba in Italy. She spent the early years of her life with her family and parish. At the age of 21 years old, she encountered Father Alberione, who invited her to assist him in the foundation of the new Congregation of the Daughters of St. Paul. She made her private perpetual religious profession on July 22, 1922 and at that point she was appointed as the Superior General of a small group of young women, giving life to the Pious Society of the Daughters of St.Paul. As she pronounced her vows with eight other young women, she took on the religious name of Thecla. Mother Thecla guided the early stage of the Daughters of St. Paul and collaborated with the rise of other branches of the Pauline Family during the 42 years she held her position as Superior General. Media instruments were the prime and sacred evangelization tools to be used by the Daughters. In addition to proving herself to be a faithful interpreter of Father Alberione in the development of the Daughters of St. Paul, Mother Thecla earned the title of “the mother of the Pauline Family” due to her collaboration in the beginnings and development of other foundations of the Pauline Family. Mother Thecla offered her life for the endurance of the inner vitality of every Daughter of St. Paul and she passed away peacefully on February 5, 1964 in Albano (Rome). The secrets of her life were those of saints and apostles: humility and faith. 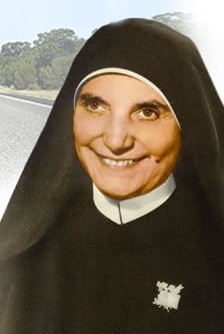 Most Holy Trinity, I thank you for the singular gifts of light, grace and virtue granted to Venerable Sister Thecla Merlo, and for having chosen and made her a mother and confident guide of the Daughters of St. Paul. Jesus Master, the Eucharist, the Church, and the Gospel announced to all with the instruments of social communication, to the point of great sacrifices. through her intercession, the grace I ask of you … Amen.